The Wisconsin solar sector has been a relative bright spot of job creation despite the steady decline in manufacturing jobs that has afflicted Wisconsin's economy. In the past several years, many firms seeking a piece of the expanding solar industry have re-tooled or expanded while at that same time several new small companies have started-up. As evidence of solars growth potential, the 2011 Solar Foundation's National Solar Jobs Census reports that 45.9% of the firms surveyed expect to add solar employees over the next 12 months. The combination of Wisconsin's legacy for renewables support, a rich manufacturing base, solid transportation infrastructure and strong in-state demand spurred by state and local incentives for solar, the state's manufacturing sector growth in solar has shined. A 2011 analysis by the Energy Law & Policy Center reported 135 solar power supply chain businesses alone. In 2011, the MadiSUN Solar program assembles the first-of-its-kind solar PV array in partnership with the several manufacturers and funded by the Department of Energy. The WisconSun Solar PV Project looked at panels, racking and inverters that make up about 80% of the cost of a solar energy system. What they found was that the make-up of Wisconsin solar PV manufacturing businesses represents a diversity of companies, from start-ups to long established firms. Panels for the WisconSun Solar PV Project came from Helios Solar Works, a builder of high-performance mono-crystalline solar modules based in Milwaukee which doubled its workforce in 2012. Helios Solar Works panels use Cardinal Glass products, a world-class solar glass producer with two Wisconsin manufacturing locations. Founded in 1972, Ingateam, which selected Wisconsin for its first US plant and will employ 275 by 2015, provided the inverter for the Wisconsin Solar PV Project. Evergreen Sustainable Products, a custom-metal fabricator based in Oconomowoc, supplied racking for the project and other manufacturers such as RSTC Enterprise, maker of Soladeck in Eau Claire, provided various other parts. Providing installation services for the project were H&H Group, which has 185 employees, and the International Brotherhood of Electrical Workers, which runs the state's foremost electrical installer apprentice program. 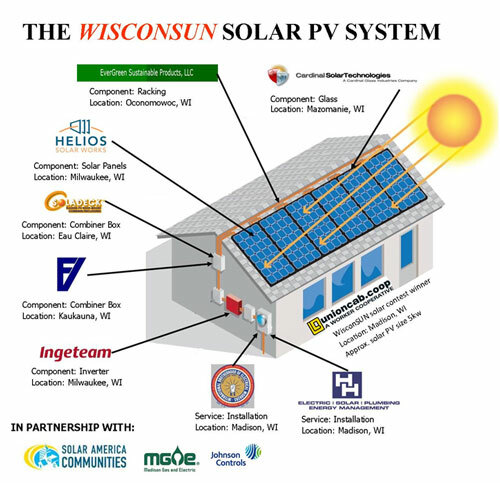 The WisconSun Solar PV project, which is scheduled for completion in April 2012, will be hosted by Union Cab, a Worker-owned and operated taxi cooperative committed to environmental responsibility and worker's rights.